You can click above to go directly to each liveblog, or you can check out the Special Report from SMX Advanced that we released yesterday, which shares takeaways and highlights from each of these sessions. In Ask the SEOs, Greg Boser, Rae Hoffman, Jeff Preston, Marshall Simmonds and Ellen White talked about the biggest issues in search engine marketing, including the state of PageRank sculpting, the impact of global top-level domains, and Penguin penalties. 25 Social Media Ideas for the Advanced Search Marketer was another key session with Matt Siltala, Lisa Williams, Mark Traphagen and Michael King. Williams talked about using social media to make connections through storytelling while King focused on the importance of research for every Internet marketing campaign — and how to use that research to inform your marketing on all fronts. Siltala took a deep dive into the role of visual content, and Traphagen taught SEOs how to build brand authority using Author Rank. 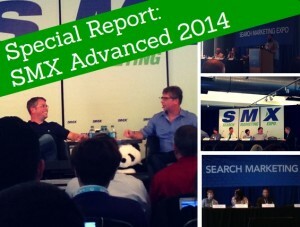 Our SEO Newsletter subscribers got the Special Report from SMX Advanced sent directly to their inbox. If you’d like SEO conference coverage like this — plus our monthly newsletter, which is chock-full of industry news and tactical Internet marketing articles — subscribe here.